Hall Alarms Ltd is currently seeking applications for the position of Electronic Security Systems Engineer, based in our Clonmel office. 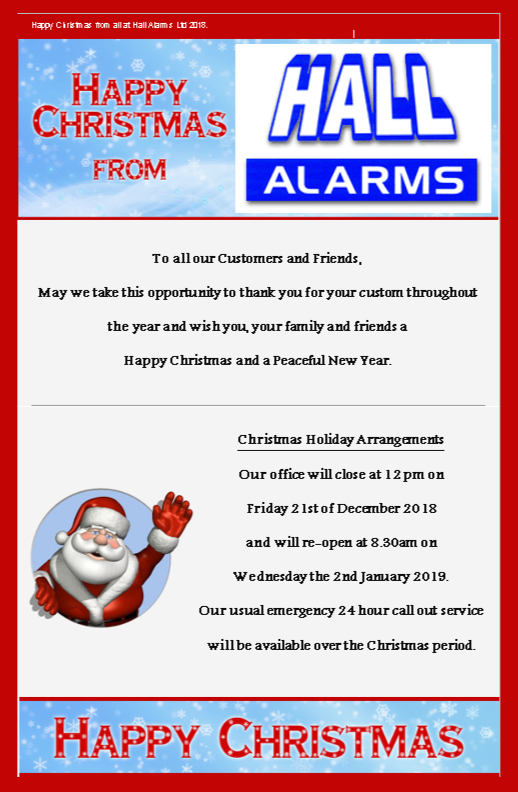 Happy Christmas from all at Hall Alarms Ltd, Please see our Christmas arrangements, should you need us over the Christmas period. I refer to the General Data Protection Regulation (GDPR) that affect the way companies access, collect and store client’s personal data. These regulations are coming into force on the 25th May 2018. 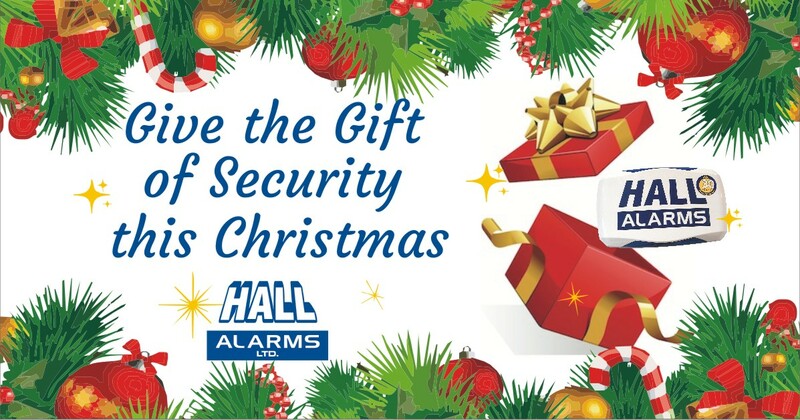 Hall Alarms Ltd stores customer data in order to provide services which include the installation, repair, maintenance and monitoring of Security, Fire, Emergency Lighting systems, CCTV and Access Control . This information is stored as long as your system is active with us, to enable future emergency callouts and servicing. Hall Alarms Limited has always been committed to protecting your data and maintaining your privacy during the course of providing these services and will continue to do so into the future. Hall Alarms Limited shall ensure compliance with laws and directives providing for the protection, transfer, access and storage of personal information. This includes General Data Protection Regulation (GDPR) (Regulation (EU) 2016/679). Hall Alarms Limited ensures that all personal data is stored safely and securely. If at any time after giving us personal information you decide that you no longer wish us to hold or use this information, or in the case that the information becomes out of date, you are free to notify us, and we will remove or rectify the information within a reasonable time and in accordance with legislative requirements. You are also entitled to request a copy of your data at any time. We are committed to keeping your e-mail address confidential. We will never provide your personal information to any third party individual, government agency, or company at any time. However we may be obliged to disclose personal information relating to you to, for example, in order to conform to any requirements of law or to comply with any legal process. Under this new Data Protection regulations (GDPR) we need to be able to prove we have consent to make contact with subscribed customers in our database, for marketing purposes. All customers that we have email addresses for, will be sent an email asking them to “Opt In” to receive the latest information and updates about our services and products. For further information on GDPR and how it affects you and your organisation, please visit the Data Protections Commissioners website at www.dataprotection.ie. • Some experience of accounts software, full training on our specific software system will be provided. Please email your full CV to CEO, Eleanor Lahart, on: eleanor@hallalarms.ie before Friday 25th May 2018. Emergency lighting is required when the main power supply is cut and any normal illumination fails. This may be a result of a fire, or a power cut and the normal lighting supplies fail. Sudden darkness is a possible danger to the occupants, either through physical danger or panic, to exit the premises safely. Emergency escape lighting – the part of an emergency lighting system that provides light for the safety of people leaving a location or attempting to terminate a potentially dangerous process beforehand. 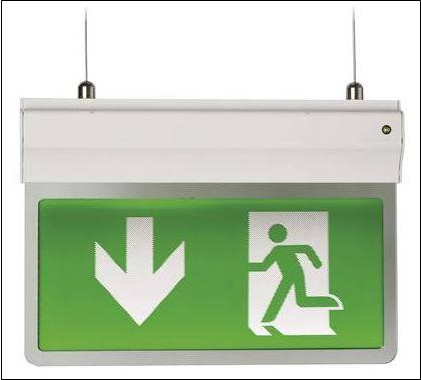 Escape route lighting – the part of an emergency escape lighting system provided to ensure that the means of escape can be effectively identified and safely used by occupants of the building. Open area lighting – the part of an emergency escape lighting system provided to minimise panic and ensure there is sufficient illumination to allow the occupants of a building to reach a place where an escape route can be identified. Near each first aid post, any escape equipment provided for the disabled, near disabled refuges, disabled refuge panels and call points, disabled refuse communication systems and disabled toilet alarm call positions. Irish Standards require written declarations of compliance to be available on site for inspection. These should detail the quality of the installation, satisfactory test of operation and a log of all system tests. System logbooks, with commissioning forms, testing forms and instructions, should be provided by the installer/commissioner. Daily Inspection – All deficiencies, defects and/or faults previously recorded in the emergency lighting logbook have been rectified and any necessary corrective action(s) to be carried out. (Carried out by owner/manager). Weekly emergency lighting inspection – As Daily inspection, plus visually check 25% of the emergency lighting system so that 100% of the system is checked at every 4 weeks. Ensure that all non working lamps are replaced. (Carried out by owner/manager). Quarterly emergency lighting tests – Ensure that inspections and testing are done so that 100% of the system is checked four times a year and is carried out every 3 months for 30 minutes. (Carried out by Hall Alarms). 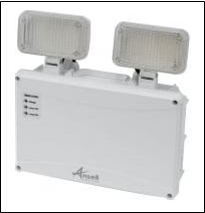 Annual emergency lighting tests – Once in every 1 year period after completion of 3 Quarterly inspections and tests. 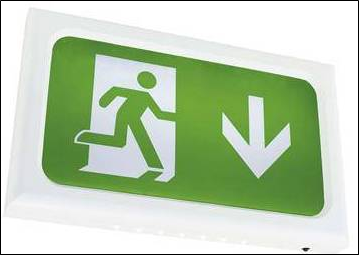 All emergency lighting systems shall be tested to their rated duration (3 hours). The result must be recorded and, if failures are detected, these must be remedied as soon as possible. (Carried out by Hall Alarms).